If you have multiple missing teeth or even if you are missing all of your teeth, dental implants could be the right solution for you. A dental implant bridge which is supported by several implants could replace a few or all of your missing teeth. 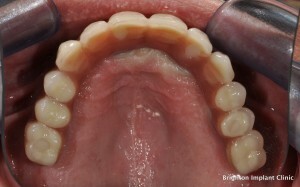 A dental implant bridge could be used on the upper or lower arch or even both. Dental implants are made of titanium and are inserted into the jaw bone during a small minor operation. Dental implant surgery can be carried out under local anaesthetic or sedation. Don’t I need a dental implant for each missing tooth ? A common misconception is that people think that if you are missing multiple teeth then you will need to have multiple dental implants to replace each and every single tooth. The reality is that its not possible to replace all the missing teeth with a dental implant. Usually there is not sufficient bone in order for implants to be placed to replace each and every tooth. 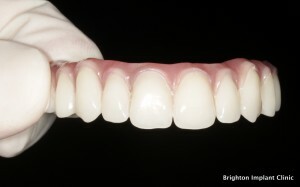 Therefore in these instances we use a dental implant bridge. A dental implant bridge works similarly to a fixed dental bridge on natural teeth. The dental implants act as supports or pillars for a bridge which is either cemented or screwed onto the dental implants. In larger cases where patients have lost all of their upper or lower teeth a full arch dental implant bridge can be made. At Brighton Implant Clinic we have gained much experience in treating numerous cases with full arch dental implant bridges. We use a minimum of four dental implants to support a fixed dental bridge of 12 teeth. If there is sufficient bone the dental implants can be evenly spaced for better load distribution. In some instances we place more implants, as many as 8 per arch if needed. Using the teeth on 4 concept we are able to place dental implants and a fixed dental implant bridge on the same day. This is truly a life changing experience for many patients who have struggled with removable dentures for many years. In just one day we are able to change this by placing dental implants and a fixed provisional bridge on the same day. A dental implant bridge needs regular and frequent maintenance. As with natural teeth, daily brushing and flossing is very important. Dental implants can fail and if oral hygiene is not good then the dental implants could fail.